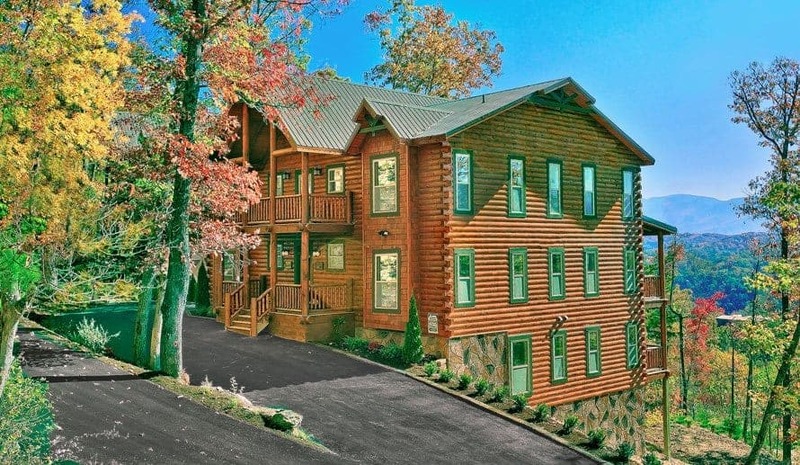 At Large Cabin Rentals, we pride ourselves on bringing guests some of the most luxurious large cabin rentals in Pigeon Forge. 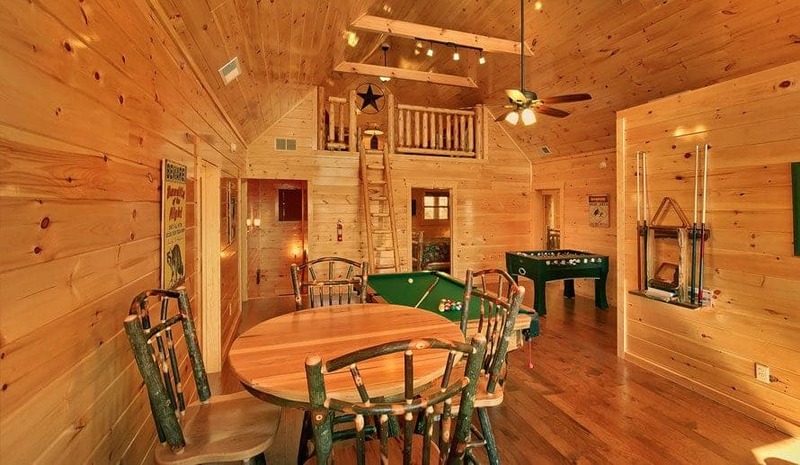 Not only are our Pigeon Forge cabins perfect for family reunions, wedding parties, church retreats and business groups, but they also come equipped with tons of luxurious amenities that can only be found when renting with Large Cabin Rentals. One of the best aspects about any vacation in the Smoky Mountains is the ability to connect with all of your friends and family through social media and show them how much fun you are having. Being huge fans of social media ourselves, we are happy to announce that each of our Pigeon Forge cabin rentals come equipped with high-speed wifi. So whether you are posting a status, sending a tweet, checking in, or trying to sneak in a little business, you will be connected to the internet throughout your stay with Large Cabin Rentals. 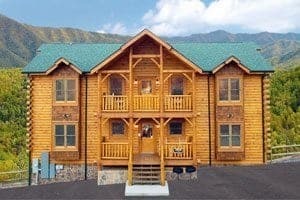 One of the biggest things we have noticed that large groups traveling to the Smoky Mountains look for in a Pigeon Forge cabin rental is they want one that can accommodate parking for motor coaches. Motorcoaches and large buses are a great way to transport a large number of people from one destination to another. However, many cabin rentals do not support adequate parking, so guests either have to walk a long distance to their rental, or they have to stay somewhere else. At Large Cabin Rentals, that is not the case because each of our large cabin rentals in Pigeon Forge fully support parking for any sized vacation vehicle. If you aren’t traveling by motorcoach, but you do plan on having more than one car, there is still plenty of parking for you and the rest of your group throughout your Smoky Mountain vacation. Just because you are on a vacation in the Smoky Mountains does not mean that you and your family will have to give up your weekly family meal. 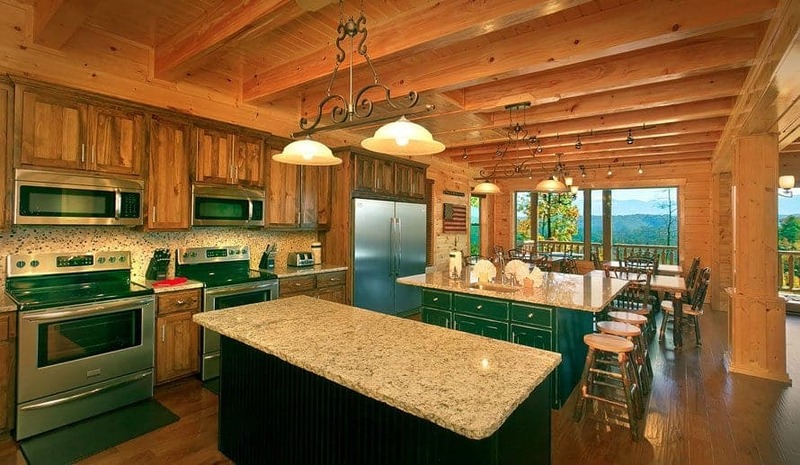 Each of our large Pigeon Forge cabin rentals come equipped with full kitchens that offer double refrigerators, double stoves, two dishwashers, and tons of seating room. 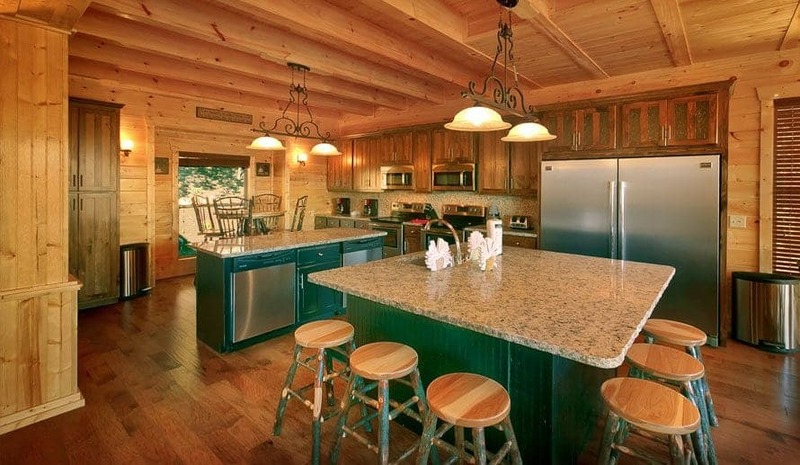 Preparing, cooking and serving meals are a breeze inside our cabins. After a fun-filled day of exploring all of the fun things to do in the Smoky Mountains, guests to one of Large Cabin Rentals’ large Pigeon Forge cabin rentals will love unwinding inside their private outdoor hot tub. Each of our vacation rentals come equipped with at least one relaxing tub. 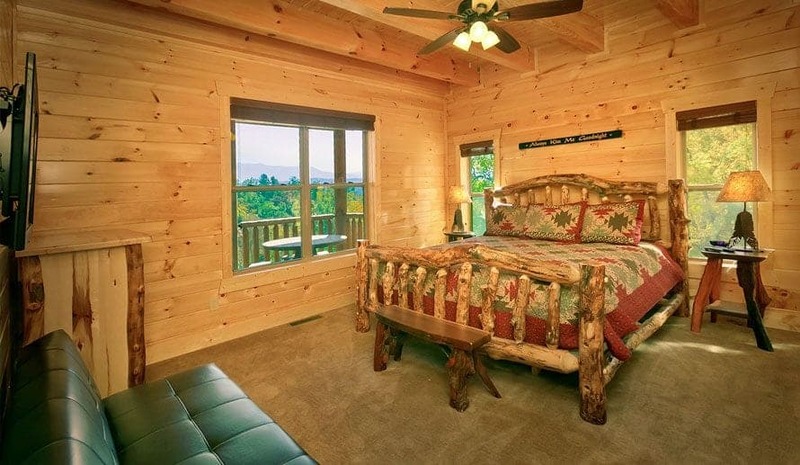 Pigeon Forge cabins with more than 12 bedrooms often offer two hot tubs for guests to enjoy. Do you have a favorite home movie or training video you want to show during your group retreat in the Smoky Mountains? Enjoy your movie in style from the comfort of the stunning movie theater room found in all of our large Pigeon Forge cabin rentals. 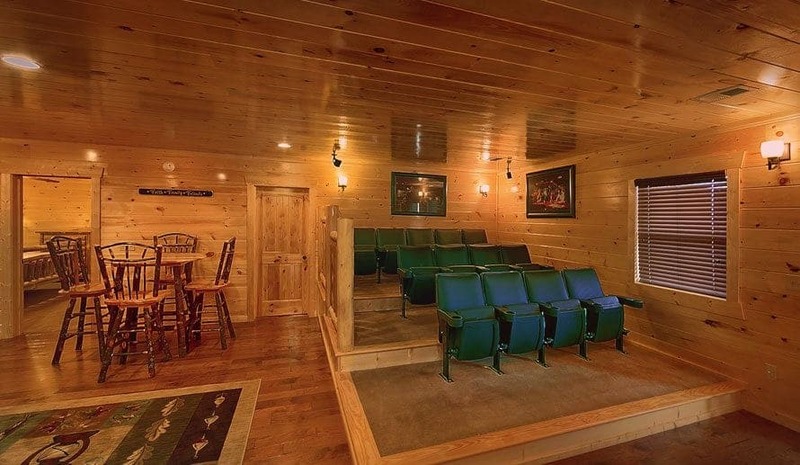 Offering either stadium-style theater seats or over-sized couches, our theater rooms are the perfect space for your group to host its own movie marathon during your next vacation in the Smoky Mountains. Dive into fun this vacation by taking advantage of the seasonal outdoor pool offered by Large Cabin Rentals. Themed after the swimming holes we visited as kids, our outdoor pool has a relaxing tucked away feel while still offering all of the modern conveniences our guests have come to expect from us at Large Cabin Rentals. Here, guests will love the chance to sit back and soak up the sun from the comfort of one of our outdoor chairs. Not to mention, kids will love playing with the arching fountains located around the pool area. There is also a private restroom facility located at our outdoor pool. Last but not least, we would like to point out the spectacular mountain views that each of our Pigeon Forge cabin rentals offer. Depending on where you stay, these views range everywhere from panoramic landscapes to relaxing wooded retreats. 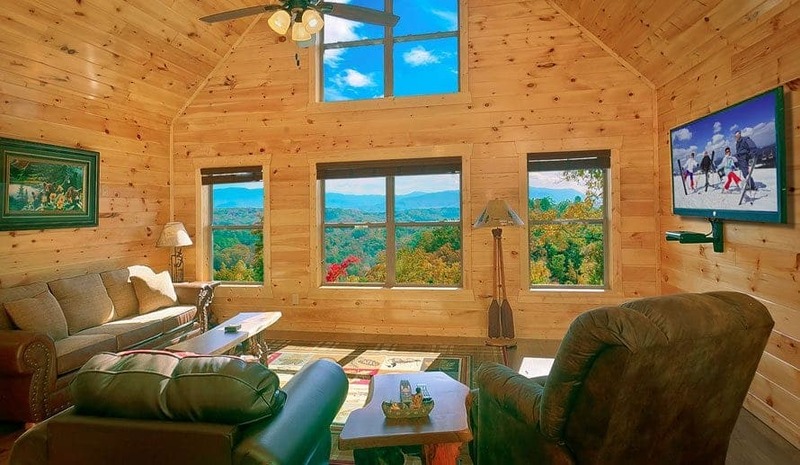 Either way, we can guarantee that the stunning view from your Pigeon Forge cabin rental will be just what your group needs to get into the vacation spirit. 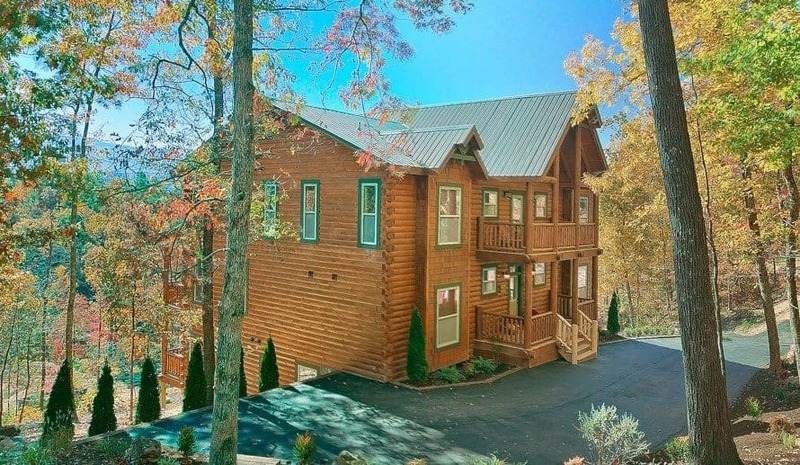 Ready to begin planning your large group’s next stay inside one of our spacious Pigeon Forge cabin rentals? Give us a call at (877) 544-9594, or fill out our Smoky Mountain vacation information contact form on our website. One of our experienced group reservationists will be more than happy to help answer any and all questions you may have.